REV. PROFESSOR H. MAURICE RELTON, D.D. AND DR. W. R. MATTHEWS. REV . PROFESSOR H. MAURICE RELTON. D .D. REV. PROFESSOR F. R. BARRY. D.S.O, M.A. REV. A. S. DUNCAN-]ONES, M.A. REV . CANON V. F. STORR, M.A. REV. CANON E. S. WOODS, M.A. REV. PROFESSOR W. R. MATTHEWS, M.A., D.D. This little book was one of several published in advance of the hoped-for approval of a new Book of Common Prayer for the Church of England. 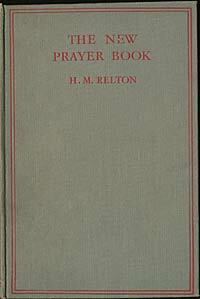 It consists of eight essays, all designed to persuade people that this new Prayer Book was needed and should be adopted. Unfortunately for these authors, it was not approved by Parliament (this was necessary as the Church of England is an established Church). However, many of the arguments put forth by these eight authors would be familiar to us today. We have the book available both as HTML text (see at left) and as a single PDF file (see below). IN issuing these eight lectures in book form, no attempt has been made to eliminate possible overlapping or even conflict of opinion. Each lecturer is responsible only for his own contribution. It is, however, a striking tribute to the nature and value of the work done by the revisers of the Prayer Book that the new Deposited Book should receive a welcome from men representing various schools of thought, and approaching the subject from such diverse standpoints. It is this fact which encourages the hope that the same welcome reception may await the Prayer Book in the country at large. The issue of these lectures will enable a much larger audience to study the reasons which have led eight representative thinkers to accept the results of twenty years' labour in Prayer Book revision. Assuming that the new Prayer Book receives both Parliamentary and Synodical acceptance, the question remains whether it will be widely used as a substitute for the old in the parishes? Here it is important to remember the part which the laity have still to play, in relation to this question. "In order that changes authorized under this measure in the customary arrangement and conduct of the services of the Church shall not be made arbitrarily or without the good will of the people as represented in the Parochial Church Council, any question which may arise between the minister of a parish and the people as so represented with regard to such changes, shall stand referred to the bishop of the diocese, who after such consultation as he shall think best both with the minister and the people shall make orders thereupon, and these orders shall be final." The laity, then, clearly are to have some voice in the question, through their duly elected representatives on the Church Council. The nature and extent of the changes which are to be introduced in the services of the Church are a matter upon which the minister is expected to consult with his Parochial Church Council. He is not given unlimited personal discretion. If what he does or contemplates doing, meets with the majority of his Church Councilors, the ultimate reference is not to be his own autocratic decision, but the final word rests with the Bishop. There is thus a real limitation to the minister's powers in this matter, a limitation expressly introduced into the Prayer Book Measure to safeguard the interests of the laity. Privileges carry with them responsibilities. If Church Councillors, representing the laity, are to have the privilege of helping to decide for or against the introduction of the new Prayer Book for use in the Parish Church Services, this carries with it the responsibility of knowing what the new Book really contains, and why, in the opinion of those best qualified to judge, it should be used. The Church authorities have almost unanimously commended it as an alternative to the old Prayer Book. A study of the Book itself from many points of view suggests some of the reasons why we should loyally accept the decision of our spiritual leaders in this matter. How may we best form something in the nature of an independent judgment so that our decision may not be a blind acquiescence in authoritative directions, but an intelligent and appreciative acceptance, such as befits those claiming membership in a Church, the keynote of which is ordered liberty? The answer is that we must study the subject if we are to have the privilege of expressing an opinion, if not a considered judgment, upon it. It may not be, therefore, presumptuous to suggest that these eight lectures in book form do give to the laity just what is wanted, viz. material to help them in forming a judgment. I venture to hope that this book may prove to be a guide and a real help to the laity, and especially to Church Councillors, upon whom under the Prayer Book Measure will rest so grave a responsibility in connexion with the acceptance or rejection of the new Prayer Book for use in the parishes. In these lectures we have said what we think about the new Book. We hope that what is here said may prove helpful to others when they have to register their decision. Download this book as PDF graphics (size=11MB). THE days for casting votes on Prayer Book Revision in the Assembly and in Parliament draw very near. In my judgment these eight Lectures provide exactly what English Churchmen ought to have in their hands. Party feeling in certain groups runs high, and plain facts are distorted out of shape. These Lectures will correct an erring vision. Again, they are helpfully untechnical. Hundreds of thoughtful people, be they informed or uninformed on matters ecclesiastical, Will find sane guidance given by the distinguished and representative writers who here contemplate the subject from very different points of view. I earnestly hope that the Lectures may have a large and immediate circulation. of the Incarnation; Some Postulates of a Christian Philosophy; etc. I DESIRE in this Introductory Lecture to suggest a point of view which I am fully aware is in advance of its time, on the question of the position of the Anglican Church relative both to Roman Catholicism and to Nonconformity. I wish to indicate the bearing of this point of view on the problem of Prayer Book revision. We may then go on to give in summary form reasons which seem to me to weigh heavily in favour of an acceptance of the new Book at the request of the accredited leaders of our Church. comprehensiveness of the Anglican Communion, we have acquiesced in the presence of men leaning heavily in the direction of Geneva and of others pressing forward towards Rome. So far we have not altogether unsuccessfully maintained something in the nature of an unstable equilibrium between these two extremes. We need not, therefore, be unduly impressed or alarmed if to-day, in relation to Prayer Book Revision, minorities in both directions are making their presence somewhat acutely felt. It still remains true that the vast majority of English Churchmen desire to abide by the principles and the policy which guided the form the Reformation took in this country. Pessimists in the past have despaired of a Church so constituted and have predicted its imminent disruption. They have, however, lived to see its survival and to benefit from its continued vitality in our English life and thought. To-day there are voices raised in despair and alarm because the Anglican Communion, like the wise house-holder, continues to bring forth out of its treasures things new and old. The emergence of an alternative Prayer Book is a case in point. In recognition of the facts that the law of public worship is too narrow for the religious life of the present generation, and that the machinery for discipline has broken down, the Church authorities have produced a Book which is at once a conservative revision and enrichment of the old. The appearance of this work after twenty years of careful thought and study, and with the most conscientious recognition of the peculiar character and ethos of Anglicanism, has, nonetheless, created a feeling of unrest in certain quarters. The Book itself has become the centre of much hope, and at the same time an object of bitter suspicion. It has stirred up old controversies which many of us thought were dead, and it has focussed attention both inside and outside the Church once more upon the whole problem of the relation of the Anglican Communion to the rest of Christendom . The new Book comes to us as the firstfruits of that "unity in diversity" which our English Bishops have reached whilst engaged in its final formulation, and which it is vital should be reproduced on a larger scale amongst the rank and file of Church members. It is, moreover, the first of what it may be hoped may prove a series of directive efforts on the part of a corporate Episcopate to lead the Church in its great task of adapting itself to the needs and demands of the new age in which we are living. I am personally convinced that much of the opposition to its acceptance would vanish at once if we could agree to adopt towards it the point of view in relation to the larger question of our place in Christendom, which I am going to put forward in this lecture. The claim of the English Church is summed up in two words: Catholic and Reformed. institutional-historical, the mystical-intuitive, and the intellectual-rational, we may say that these three are, no matter how inadequately, represented in the Anglican Communion by the three schools of thought which we have been accustomed to distinguish under the names of "High," "Low," and "Broad" Church. Each of these has in the history of our Church received at different times undue over-emphasis. More particularly the Evangelical Movement threw into prominence the values represented by the mystical-intuitive strand; the Oxford Movement, if you like as a reaction, called attention to the almost forgotten truths of the institutional-historical strand, whilst in our own day we are witnessing the increasing influence of that attitude of mind which is covered by the term "Modernism" or Liberalism and which is seeking to bring to bear upon both Sacramental and Mystical religious experience, the acid test of the rational-intellectual strand in our religious make-up. Now, quite clearly, the Anglican Church, to the extent to which it bears a faithful witness to all these strands in its religious life and thought, must allow room for a wide diversity in a more comprehensive unity. If in the past one or other strand has been unduly minimized, we must be prepared to witness movements to-day towards a more equitable re-adjustment. As a matter of fact there is a strong movement going on now under the name of Anglo-Catholicism with a distinct trend in the direction of Sacramentalism. There is also a "Modernist," "Liberal" or "Critical" movement. We need not fear, however, that either of these two movements will be allowed to run to such extremes as to threaten to submerge that in Anglicanism which is vital to its growth and well-being. The history of our Church in the past and the character of our people give us ample justification for a sane optimism as regards the future in respect of both these seemingly conflicting and diverging tendencies in religious thought, now being somewhat acutely felt amongst us. What we have to remember is that our own particular individual preferences for one or other school of thought in the Church must not hinder our frank recognition of the lawfulness of the others as integral parts of the whole Anglican Communion to which we all belong, and for the well-being of which we are all called to work together endeavouring to keep the unity of the Spirit in the bond of peace. Comprehensiveness implies a fellowship and a readiness in that fellowship for mutual forbearance and toleration in our relations one with another. And this not least when we come to study together a new Prayer Book deliberately drawn up with a view to doing justice to all three schools of thought in our Church and representing the limits of concession to all parties which our present Episcopal leaders felt able to make if in the production of this new Book they were to preserve amongst themselves that unity in diversity which they had reached and now wish us to copy. We have, moreover, to remember that in the effort of the English Church in the sixteenth century to hold its own during a difficult and critical period in its history, emphasis was laid unduly upon points of difference between ourselves and Rome, whilst there was a tendency to minimize those elements in Catholicism which are common to the whole Catholic Church, and not necessarily in any exclusive or distinctive sense Roman. The history of our Church, more particularly since the Oxford Movement, has been largely one of attempts at re-adjustment of emphasis and the recovery of much which we have come to see is essential for the well-being of our branch of the Catholic Church. All parties in the Church have benefited from this recovery of a sane Catholicism. Churchmen have been overjoyed to discover that our Prayer Book in its wide comprehensiveness allowed room for the essentials of our Catholic faith, and in matters of rites and ceremonies we still have that freedom which pertains to local or national Churches, of selection and rejection. This growing appreciation of our Catholic heritage has enabled many to find a home within the borders of the Anglican Communion who otherwise would have sought it elsewhere, and there are not wanting signs that those at present separated from us are looking somewhat wistfully to our Church as the possessor of much, the lack of which is beginning to be felt amongst them. This would not be the case if we at the Reformation had yielded to the pressure of Continental Protestantism and repudiated essentials in our Catholic faith and practice at the dictation of English Puritanism. Clearly, however, the fact that there is so much of Catholic faith and practice common whole Catholic Church, of which we are a part, and something that is distinctively Roman, and as some of us think anti-Catholic, makes it incumbent on English Catholics to define their position more clearly and to state explicitly what that "something" is which justifies their repudiating the Roman Church and remaining loyal members of the English Church. Personally I am convinced that if not now, certainly within the next quarter of a century, we shall have to define a line of demarcation relative both to Rome and to Geneva, and to state in no unambiguous terms precisely why we are not Roman Catholics and why we are not Nonconformists. Can such a line be drawn relative to Roman Catholicism, and, if so, where is it to be drawn? I leave aside for the time the corresponding query relative to Geneva and concentrate upon the immediate issue of "Romanism" because one of the charges most frequently brought against the proposed new revision of the Prayer Book is that it attempts to bring us more into line with the Roman Church, and thus threatens to undo the work of the Reformation. Clearly, so long as such a line remains undrawn, the vast majority of sane Evangelicals can only go on denouncing as "Roman" what is really common to the whole Catholic Church, and to which therefore English Churchmen have as much right as their Roman brethren. This necessity of denouncing any and every departure from a dead past is a disastrous policy, because (a) it does but accentuate party differences; (b) it completely misses the points at issue; (c) it acts as a paralysing influence over all attempts to re-adjust our Church to modern needs and modern modes of worship; (d) it leaves the Roman question practically untouched, whilst we waste our energies in quarrelling over minor points amongst ourselves, which could and must be settled with reference to our own domestic needs as the Church of the English people, and with no necessary reference to Rome at all. I would submit that much of our past controversies has been due to the efforts to draw that line of demarcation at the wrong point. Take the question of Rites and Ceremonies. I would suggest that it is useless for a living Church with a liberty of self-determination in matters of rites and ceremonies to draw the line of demarcation within that sphere at all. We must be free to try experiments. We must be free to learn from Our neighbours, and if necessary to borrow forms of service and to copy modes of worship from any and every quarter if, after mature experience and due testing, we discover that they are in any way a help in the religious life. Under Episcopal authority there is room for a large measure of ordered liberty; scope for experimentation in matters of rites and ceremonies, and into this sphere the Roman question need not necessarily be introduced. After all, if in one or two respects we incorporate into our English Use forms borrowed from other quarters, this does not vitally undermine our distinctively English position. It does but show our wisdom in spoiling the Egyptians. Take next the question of Doctrine. If we agree that the line need not be drawn within the sphere of rites and ceremonies, must it then be drawn in doctrine? Here, again, I would submit that we are not at the vital point of difference between English and Roman Catholicism. We still have our Catholic faith in common with them, embodied in our Creeds. We still have our appeal to antiquity: the Church to teach, the Bible to prove. Where we believe Rome has impaired the soundness of the Catholic faith, once for all delivered to the saints, we are still free to instruct our people and to guide them in the discernment of the wheat from the chaff. It will not be denied that all parties in the Church in this respect have much to learn from one another before we can live at peace. I submit, however, that these questions may safely be left to time and further study. We can let the appeal to sound learning do its work. We can discuss these questions among ourselves, and seek to discover how far we can conserve the truths of Catholicism, whilst avoiding those expressions of them in which we think that Rome has introduced an element of error or exaggeration. We are still at liberty to allow a large measure of freedom in the re-presentation and re-interpretation of the faith in terms of modern thought. Any "Modernist" controversy which results as a by-product of such efforts may, I suggest, be safely left to the wise handling of our English scholars without any undue risk of the result being such a repudiation of the essential truths of Christianity as would endanger our claim to Catholicity in doctrine. Here, again, we in the English Church are more favourably situated for dealing with this vast and difficult question than any other branch of the Catholic Church, whether Roman or Eastern Orthodox. Some of us believe that our best contribution to Catholicism as a whole, and our most useful service to the Catholic Church, in a World of growing knowledge and advancing thought and discovery, lies in our wise handling of this vexed problem. There is nothing distinctively Roman about the matter at all. The Roman Church itself may yet bless the day when the freedom which our Church enjoyed, and which was denied to it, was used for the benefit of the whole Body of Christ. It has never been a claim of the Anglican Church that, in matters of doctrine, it possessed an infallibility which precludes any repudiation of particular interpretations of doctrine which commended themselves to generations that are past, but which we now see to be to-day no longer tenable. If we repudiate, as we justly do, Papal infallibility, we equally repudiate a verbally inspired Bible. The attitude of mind in our own day, which is covered by the terms "Modern," "Liberal," or "Critical," is one which has in it the promise of a fearless search after truth , un-trammelled on the one side by a rigid authoritative dogmatism, and on the other by an unbridled licence of free-thinking. The real issue to-day is not so much one between Papalism and Anglican-ism in matters of belief, as between revealed truth and rationalism. It is not untrue to say that in essence what is at stake is not the survival of anyone type of Churchmanship, but the survival of the Christian religion itself. In the English Church we make our appeal to sound learning. If He who is the Head of the Church is the Truth Himself, we believe that no new truth can contradict His revelation. "The worst form of infidelity," professor Conklin has told us, "is not disbelief in doctrines, whether theological or scientific, but disbelief in the ultimate triumph of truth." The task of the whole Church is to vindicate Christian doctrine in the light of modern thought. We do not claim that the sole authoritative interpretation of Christian truth is to be found in the Anglican presentation of it; we are willing to learn and are free to learn from all quarters; and if the result of further thought and study shows us that there lies in Sacramentalism a truth to which we in the English Church have not in the past done adequate justice, we may safely re-adjust our thinking and our practice so as to reap the benefit of this new light, whilst thankful to Rome for the unflinching witness it has borne in the past, and still bears to-day, to this distinctive feature in Christian religious experience. The time is surely overdue for us to say quite definitely that our modern Evolutionary outlook makes it no longer possible for educated people to imagine that truth reached its final form in the sixteenth century and is to be found best expressed in the Thirty-nine Articles. The Bishops are right in stating that no change of doctrine is involved in this new Prayer Book, but only a change of emphasis in doctrine. We can only regret, however, that they have not had the courage, at the same time, to say quite explicitly that the English Church is free to alter its formularies if it wishes, and that it is not hidebound to a dead past in the matter of doctrinal formulation. In the new Book there is no change of doctrine. This must not be taken to mean that in the future no change is possible. We know now that truth is not static, but dynamic. The old Protestant idea of an infallible Bible is bankrupt. The time is overdue for the Church boldly to put the Old Testament into its right place relative to the New, and to accept the consequences which we know must follow from our adherence to the idea of a progressive revelation. We must refuse to bind the thoughts of our children by a rigid adherence to what our forefathers imagined was the final Word of God. The Living Spirit in the Living Church has yet many things to teach us in the age-long effort to lead men into all truth. In a world of life and thought governed by the principle of Creative Evolution, we must look to the future, rather than to the past, for the final form in which truth is to present itself to our finite minds and to find its expression in our changing forms of worship. Those of us whose minds are not in the pre-evolution stage must welcome this new Prayer Book as a fine flowering of a creative process in the sphere of Liturgiology. It contains within it all that is best of the old, and at the same time it registers what We have come to value as helpful enrichments for our present-day needs. To think that no change of emphasis in doctrine was necessary, and no abandonment of antiquated theology imperative in the light of modern thought, is to deny the guidance of the Holy Spirit. Living in an age when scientific discoveries have revolutionized our modes of thought; when historical criticism has changed our views concerning Holy Scripture; when theological discussion has shifted from many of the subjects which were matters of burning controversy in the sixteenth century, but which now appear to us to-day, in the light of our modern knowledge, as only of antiquarian interest, is it small wonder that we have come to have a deeper appreciation of other points of view than our own, and are more tolerant of other forms of worship than those to which we ourselves have grown accustomed? The old idea that people must all worship alike, and the consequent effort after a dull uniformity, must now give place to our modern effort after "unity in diversity," both in our approach to truth and in our expression of it. We have come to see that no branch of the Catholic Church is the happy possessor of all truth. On the contrary, each branch bears its witness more or less adequately to one or other of the many aspects in which the whole truth presents itself to succeeding generations. Hence we are the more ready to learn one from another, since we are all, more or less, like men groping in a fog. We know not from day to day whether some new flashlight from Science may not suddenly illuminate our darkness and force us to re-direct or to re-trace our steps in the quest after a more satisfying form of expression for our religious beliefs. The pre-suppositions of our modern approach to Christian doctrine make a repetition of our quarrel with Rome in this sphere in terms of the thought-forms of a bygone age simply absurd. What we have to ask of any new presentation of Christian doctrine in terms of modern thought is this: not whether it is Roman or Anglican, or whence its origin, but, is it true or false? If it is true we must accept it, no matter where it came from and no matter how much we may personally dislike it. Our present-day problem is the relation between Science and Religion; between revealed and dis-covered truth. Our pressing need is some synthesis between these two. We agree that "if Christianity is false, it cannot be saved by theology; if it is true, it cannot be destroyed by science." In the light of this larger problem, the question of a fundamental cleavage between Rome and Canterbury, in the sphere of revealed truth, is seen in its truer perspective. The question of doctrine is one which must be settled not so much by reference to the Roman or the Anglican presentation of it, but rather by reference to that presentation of it which we are coming to realize must be made, if it is to accord with the best results of modern research and inquiry in every department of life and thought. I suggest, then, that neither in matters of rites and ceremonies, nor even, in the first instance, in matters of doctrine, can we to-day draw the line between ourselves and Rome. There are, undoubtedly, at present great differences between us in this sphere, not least in the spirit in which we approach the investigation of the problems of reason and revelation and our whole handling of the question of the relation of the Faith to modern thought, but this difference in spirit, as well as in content and form, between us and Rome in the sphere of doctrine, need not in the future prove an insuperable obstacle to reunion. If not in rites and ceremonies, nor in matters of doctrine, where is the line to be drawn? Here I may be in advance of my time, but I suggest that it ought to be drawn where, in the first instance, it was drawn at the Reformation, viz. in the sphere of jurisdiction. Are we to continue to quarrel amongst ourselves as to whether we are or are not to be allowed to enjoy our full Catholic heritage within the wide comprehensiveness of the English branch of the Church, Catholic and Reformed, or are we to concede minor points of difference concerning rites and ceremonies and doctrine, in a spirit of Christian fellowship, which can embrace wide differences of temperament, and conserve all that is of real and permanent worth in that for which each school of thought in the Church contends? If we do so, we can sink our differences in a new attempt to close our ranks and guard our grand old mother Church from the real dangers of Papal aggression and secularism. It may be said that what we are, in substance, asking our Evangelical friends to do is to abandon whole lines of defence against Roman teaching and practice, and to retire or to retreat back to a line of defence far in the rear of that at present occupied. The answer is that at least we should all be found at that back line with our differences composed in the face of a foe whom we should all agree to recognize as a foe at that point. Short of that point, we are not at present prepared to see eye to eye with our brethren as to what constitutes our opposition to Rome, and wherein precisely lies the justification for our present (if you like as distinct from our past) separation from Rome. In any case nothing but good would come from such a definite defining of our position relative both to Rome and to Geneva, re-stated to-day in the full light of our modern knowledge and our modern approach to these vexed questions. So much, then, on the question of drawing the line of demarcation, and defining our position relative to the rest of Christendom. Let me now pass to the consideration of the peculiar position and consequent tasks which pertain to the Anglican Church in the fulfilment of its mission, so far as these have a bearing upon the significance of the new Prayer Book as an instrument for facilitating the work of the Anglican Church. As members of a Church claiming to be at once both Catholic and Reformed, we are engaged upon a great experiment. We are trying to hold together in a fellowship both Evangelicals and Catholics. This experiment has not been altogether unsuccessful in the past. The new Prayer Book offers us the chance of continuing the effort in the future upon a wider basis and with the aid of that modern approach to the consideration of the values for which these two distinct types of Christian piety stand. We are experimenting with a view to a possible synthesis in the future. If we succeed, we shall have demonstrated to the whole Church and to the world the possibility of a reunion between Catholicism and Protestantism. If we fail, there does not seem to be any other place where the experiment can be tried under more favourable and hopeful conditions. This new Book gives both schools of thought the opportunity of trying in a common form of worship to find that unity in diversity which seems to be the sole foundation upon which a union between the two can be achieved. Given Disestablishment, however, and at once each school will tend to revert to the development of its own distinctive type of Christian belief and experience in isolation, either within the ranks of the various sects or within the fold of a Papal absolutism. Clearly within the Church we have the opportunity of combining the Evangelical experience of the Cross side by side with the Catholic experience of the Altar. A Prayer Book which gives us at once a Liturgy in line with the best traditions of the Church, apart from any question of emphasis in an Eastern or a Western direction so far as its form is concerned, and at the same time allows for an element of ex tempore prayer in its public services in the midst of an ordered form of worship, is a Book which should win the affection of all those who value both the Sacramental and the individual approaches to the Throne of Grace. Moreover, a Church which combines Catholic with Evangelical in a common form of worship must in its Service Book allow, as this Book does, for a large element of Sacramentalism. It safeguards us, however, from the dangers of an undue stress upon this element developed in isolation, by laying an unmistakable emphasis upon the Evangelical principle of Faith. If we repudiate Sacraments altogether, our place is with the Quakers. If we exalt faith into a quasi-magical human effort to coerce the Presence of Deity according to our passing whims and moods, our place is outside the Church which clings tenaciously to the truth of an institutional-historical strand in Christian experience of the Risen Lord through ordained channels of Grace. If we deny the necessity of faith, not, indeed, for the validity but certainly for the efficacy of Sacramental Grace, we lay ourselves open to the dangers of superstition in another direction. Our new Prayer Book offers us the chance of trying through corporate worship to recognize and to value in experience the truth in both the strand of institutional and the strand of intuitive religious worship. These, then, are the larger considerations of principle and of policy which, in my judgment, should decide our attitude towards the present effort of the. Church under Episcopal leadership to produce an alternative Prayer Book better fitted to the needs of our day and generation than is the old Book which no one now uses in its entirety. The acid test to be applied to such a new Book is surely this: Does it help us the better to worship? What was needed was such a revision and enrichment as would help the Clergy the better to lead their congregations in a common effort to realize the Presence of God and to worship in His Courts. A secondary object was to produce something in the nature of an agreed form to which most, if not all, could loyally adhere. Judged by these two requirements, the new Book seems to fulfil the first, and is designed, if not destined, to fulfil the second. May I in conclusion give, in summary form, reasons why it seems to me that we should loyally accept it in obedience to the request of our Church authorities? (1) The new Book is optional, not compulsory. This is the answer to that large body of opinion which still presses the question: Why is any revision necessary 1 Why not leave the old Book untouched? We cannot accept this new dogma of a verbally-inspired Prayer Book which must not be altered because we in this generation are said to be lacking in those gifts of literary diction which were conspicuous at the time when the Prayer Book was first drawn up. We must realize that a form of worship which remains rigid and unaltered over too long a period of time becomes a stumbling-block to many, and even an instrument for the quenching of the Spirit. In recent years, and especially as the result of the War, the spirit of worship has overflowed almost all its forms, and we have been forced in consequence to seek for new avenues for its expression, in the effort to make our Church services a living reflection of our religious life and thought. The old Prayer Book remains for those whose gaze lies in the direction of an age-long past: the new Book greets those who face the unknown future. (2) One of the main objects of the revision was to pave the way for a restoration of discipline in the conduct of the public worship of our Church. The issue of this new Book, under authoritative sanction, removes legitimate excuses for inability to conform to the old rubrics and regulations which we have outgrown, and furnishes us with a new set to which all can conform. We are thus offered a fresh chance to end the unfortunate period of licence and confusion in which we find ourselves to-day, and in which every man apparently holds himself free to do what is right in his own eyes, a licence which is morally indefensible, and injurious both to clergy and laity alike. In place of lawlessness, we are now given an opportunity to return to ordered liberty. If we combine in a loyal effort after Canonical obedience to a constitutional Episcopal government, we shall regain the confidence of the nation, the good will of our own people, and our own self-respect as men under authority. If the question be pressed as to what guarantee there is under this new Book for loyal obedience to its requirements, the answer is: (a) the moral appeal of a united Episcopate for loyalty and order must bear fruit; (b) the Prayer Book Measure is part of a larger movement for the reform of the Ecclesiastical Courts; (c) if we reject this new Book and the opportunity for a fresh conformity to loyalty and order, what is the alternative? A period of intensified party strife, to be followed by a strong demand both from within and from without the Church for Disestablishment. The probable issue of this would be the final disruption of the English Church with disastrous consequences both for the nation and for Christendom. (3) To plead for further delay at the eleventh hour in the hope, apparently cherished by some in both schools of thought, that a more prolonged discussion of controversial points may issue in further concessions being made by our Church authorities to one or other party in the interests either of Geneva or of Rome, is to mortgage the future of the English Church and to court disaster. Now that both Convocations have decided in favour of the Book by overwhelming majorities, the question is settled for all those who respect constitutional government and repudiate ecclesiastical Bolshevism. (4) Finally, we are weary of party strife. This Book does offer us the possibility of an ANGLICAN ARMISTICE, paving the way to a permanent peace. The World Call, meantime, summons us with no uncertain note to larger tasks and greater self-sacrifice. If we answer that Call, we shall find ourselves lifted out of the stuffy air of self-seeking into the purer air of self-sacrifice. In such a higher sphere, and under the inspiration of larger loyalties, there lies the promise of the discovery for our English Church of a sinking of its differences in a deeper unity in worship and service. Our greatest need to-day, both in Church and State, is a new spirit. We want a rest both from industrial and from ecclesiastical strife. We want in every Rural Deanery throughout the land, by means of study-circles, lectures, conferences and discussions, to examine afresh our differences and to try to see each other's point of view. We in the Church need to work together for the production of that larger synthesis in thought and life and worship to which our modern approach to old religious controversies seems to be tending. Some of us may feel disappointed that our Fathers in God in this new Prayer Book have not allowed us to go beyond certain points, either in the direction of Geneva or of Rome. We may yet live to be thankful that they in their wisdom allowed us to go so far and no farther. Who knows but that at the heart of things in this new Prayer Book which now we most intensely dislike, there may not lie hidden, if not for us, yet for our children and for generations yet unborn, an unsuspected blessing? the Spirit and the Life of To-Day; etc. THE proposals for the revision of the Prayer Book have been considered from many different points of view; yet oddly enough not many of those who discuss them so eagerly seem to start with any clear convictions about the nature, the use and the essential character of a book of Common Prayer. So I propose to begin by asking what such a Common Prayer Book is, and what it is required to do: after which, perhaps, we may be able better to appreciate the merits and short-comings of that which is now being offered to us. What, then, is the Anglican Prayer Book? It is a book which is, in its way, unique; for it differs from the great service books of the Latin and Orthodox Churches -— which are composed by declaration mainly for the use of the clergy — in belonging equally to clergy and laity. It is meant to be the common property and common guide of the whole household of faith. It contains the verbal forms, and the directions for the religious acts, under which a specific Christian community — the whole of the English Church — shall, as a body, approach God; express its manifold relationships with the Eternal World. Hence no Prayer Book can or should express the whole personal religion of those individuals who use it; still less should its contents be expected to provide decisive rulings as to what this religion should be. It is an instrument, not a code: an instrument whereby many human souls, at many different levels and with many different outlooks, may be blended to perform one combined act of adoration and surrender to the one God. Thus, to talk about being "loyal to the Religion of the Prayer Book," is to put the cart before the horse. It is for the Prayer Book to keep as close as may be to the living and growing soul of the Church; not for that living and growing soul to make a virtue of keeping close to a static Book. There is here no sort of equivalence whatever between the New Testament and the Prayer Book. One is a closed collection of writings which enshrine God's supreme revelation in history. The other is a part of the domestic apparatus of the household of faith: a means of promoting and directing that corporate adoration of God, which is the essence of institutional religion. At best it represents good family customs, to be respected rather than slavishly conserved. Lest this be regarded as a partisan utterance I would add, that to talk about the "religion of the Altar" seems to me just as unreal as talking about the "religion of the Prayer Book"; unless we are also prepared to talk about the "religion of the Font." Thus to isolate anyone factor of the great religious complex is surely to miss the entrancing beauty of the whole. So let us keep a sense of proportion; and remember that as the body is more than raiment, so living religion is more than the forms — even the loveliest, most venerable and most significant forms — in which it is expressed. Unless we thus try to understand a little of what institutional religion is and tries to do, we have no very sufficient material for judgment of its official books. For the very character of an organized Church involves for its official book certain conditions which must be satisfied, if that book is to have more than a sectional appeal and sectional usefulness: and yet these conditions can only be satisfied under certain limitations and in certain ways, if the fundamental nature of a Church is to be preserved. I want to consider three of the conditions which such a Common Prayer Book must meet; and inquire shortly how the Revision looks from this point of view. In the first place, institutional religion, which in so far as it is religious, so clearly points beyond itself and reaches out to that which transcends history, is yet no less clearly itself a part of history. It has, as à Kempis says, an eye that looks on Eternity and an eye that looks on Time. It enters fully into the life of succession; its tradition stretches backwards into the past, its life leans out towards the future. Carrying and expressing our little human love of the Abiding, it is itself conditioned by the law of change; and perpetually brings into a touching association the unchanging Majesty of God and the little changing insights and desires of men, with their close dependence on the life of sense. It must, therefore, have words for the adoring joy of the soul that has caught a glimpse of the Transcendent, and for the sudden return to our creaturely status and need. "Holy, Holy, Holy, Lord God of Hosts; Heaven and Earth are full of Thy Glory . . . we are not worthy to gather up the crumbs under Thy table." Here, in this balanced divine and human reference, are the two poles of man's spiritual life; the twin dispositions which organized worship ought to evoke and express. Liturgic forms may safely be judged by their ability to introduce more and more souls of every level more and more fully into this balanced mood of humble dependence and disinterested delight. Further, the identification with our changing world and changeful selves by which a Church must show itself to be truly living, must no less clearly be balanced by a certain historic stability; by that power of endurance inherent in all real organisms, which carries forward the past into the present. The institution is here the visible embodiment of that communion of saints, that Super-natural Society, which both transcends time and indwells it. The one Catholic and Apostolic Church is alike the Church of the Apostles and that of all its converts yet unborn; and this not merely in succession, but in a certain sense simultaneously. Therefore its official book must conserve an historic sense, a certain continuous tradition of language, symbol and action, together with the flexibility of life. Not Scripture alone, but the long life stretching through the centuries from the Mount of Olives and the Upper Room to our present day, creates the standard to which it must conform if it would be careful of the type. Thus our Book of Common Prayer must be the Book both of a living and of an historic society. In it, novelty and stability must combine. In so far as one of these elements ousts the other, the life of the Church is impoverished; as a plant is impoverished, if roots and branches develop unevenly. Now look at the Revision from this point of view. How does it maintain and extend this double principle of stability and growth? Surely here we find both the historic attachments and the fresh and living applications of prayer and adoration deepened and emphasized. To take a few simple examples. Those who use the new Communion Office can now, at the beginning of their most solemn devotion, reascend the centuries and say with the first Christians the Kyrie Eleison, one of the most primitive and universal prayers of the Church. We are given, in the set of 1nvitatories for each season, now introduced into Matins, and also in the greatly lengthened series of special Prefaces to the Sanctus, a fresh opportunity of remembering and renewing our attachments with the great historic moments of Christianity — the Annunciation, Transfiguration, the Institution of the Eucharist, the festivals of the Saints — and thus are reminded of the concrete and factual character of Christian belief. Yet in the additions which have been made to the occasional prayers and thanksgivings, our most modern problems, institutions and activities are brought within the same sphere of divine action, and formed into links of the same continuing chain. The continuity of Christian worship, the daily use of that Hebrew poetry which was so often on Our Lord's lips, the antique songs of adoration which are woven into the very life of the Church — all this of course remains in the Offices of Matins and Evensong, to stimulate and express our common faith and love, and keep us in touch with our historic past. But the restoration of the simpler, more intimate morning and night Offices of Prime and Compline, so actual and so traditional, is surely a step forward in this rightful consolidation of past and present; and gives every Christian a form by which he can unite in prayer with the soul of the Universal Church. Above all, the beautiful intercession for "the whole state of Christ's Church" in the alternative Communion Office — bringing together in one fellowship all souls living and dead, from those saints who are the pride of the Christian family to our struggling selves — must strengthen our sense of real membership in a Supernatural Society: a Mystical Body which transcends and yet indwells time. Next, the Book of Common Prayer is "common," not only as between past and present, but as between all the varieties and types of soul which form the household of faith. It is not merely intended to be used by developed saints; or even by trained ecclesiastics, as were the monastic Offices of the mediæval Church. It is meant for average human beings; half-grown, half-real, pathetic creatures, differing much in capacity and outlook, following many paths to God, but seldom capable of abstract conceptions or supernatural flights. Thus it is required to meet, and be adapted to, the average mental and spiritual capacity; and must include in its span those interests which the ordinary man and woman are able to carry up into God, those human occasions and crises-marriage and child-birth, sickness and death-when His Presence is most likely to be realized in their souls. The Church's guide-book to adoration, already required to be both transcendental and historical, to maintain continuity with the past and leave scope for novelty in the future, must therefore be actual and homely too. Here it is not necessary to say much in commendation of the new Book. It is generally acknowledged that in the fresh prayers and thanksgivings — e.g. those for schools, universities and hospitals; for missions, for industrial peace — in the permissive use of extempore prayer, in the readjustments that have been made in the service of Baptism, with its prayer for the home and its more genial view of the unregenerated baby; in that of Marriage, with its abandonment of needlessly archaic language and admiring references to polygamous patriarchs; and in the less formidable and more pastoral the directions for visitation of the sick, the revisers have successfully modified the seventeenth-century atmosphere. In these and many other instances, there is surely now a greater chance of sympathetic contact between the average worshipper of our own day and the forms he is required to use. So, too, in the permitted enhancements of the service of Holy Communion, we seem to see the beginnings of official recognition that, for the human creature made both of sense and of spirit, religion must have its sensible as well as its spiritual side; God must be found in things as well as in thoughts. I do not wish to develop this argument in any way that can be regarded as controversial; but merely to state my own feeling that in its guarded but definite sacramental emphasis, the new Book looks at least as much towards the future as towards the past. Thirdly, the Book of Common Prayer is used in, and will inevitably give its special colour to, those periods in which these average men and women will be most fully self-opened towards God; deliberately orientated to spiritual realities, and sheltered from competing interests. The times we spend in church are for most of us our . distinctively religious times, and our moments of maximum religious suggestibility. Thus the forms then used will condition not only the ways in which we actually look at God, pray to Him and worship Him, and sanctify in His Presence the mysteries of life; but will also have their educative aspect. They are the Church's great chance of teaching her children how to pray, love and worship better. A liturgy or Office is a verbal link between the corporate soul and God ; and while at one end it must be in the fullest possible contact with humanity, at the other end it must move out from the human to the Divine, and suggest by its ritual phrases and the sequence of its thought, the supernatural end of every prayer. Thus furnishing a frame for man's humblest but fullest contact with God, its rightful use should lift the heart of each worshipper a little higher than it could have got alone. The services of the Church are or should be the best opportunity hundreds of these worshippers will have of participating in, and being nourished by the whole rich, historic and eternal life of incarnational religion. How important then it is that the Prayer Book, which by its verbal forms and ceremonial directions gives unity to this worship, should be so framed as to make the fullest possible contact with spiritual realities for the greatest possible number of these various souls. Whilst it meets them at their own level, gives them words to use which they can understand, it should also help them to transcend that common level; disclose, at a moment when they are ready for such revelation, the horizons of the Eternal World. Here the function of a liturgy is not unlike that of music and poetry. It appeals to, and stimulates, the transcendental sense. The Sanctus, the classic expression of all worship, is a perfect instance of such appeal. And if our liturgic forms as a whole are to do this, they must have a general orientation that shall be true to the profound spiritual instinct which speaks in the Sanctus and centres all religion on the pure adoration of God; thus promoting a type of worship that evokes the latent religious sense of men, educates it, and gives it suitable suggestions. Here is the most potent of those instruments through which the corporate spirit can work upon, deepen and enlarge the capacities of the individual soul. And such feeding and fostering of the individual by the corporate life is surely a major function of institutional religion. Now I think no one can deny that the Revision does involve an advance in this conception of worship; that it gives at many points new precision and new beauty to the common devotional life. It does this, I think, both in its least controversial and in its most controversial parts, which can only be understood as forming part of a coherent system; and many of the apparently alight changes which have been made reveal their true significance when regarded from this point of view. Consider, for instance, the revised services of Morning and Evening Prayer. Here, for the first time, the liturgical material is so arranged as to make it clear that the object of these Offices is to praise and adore God according to the historical method of the Church of Christ: and that the preparation of the worshippers for this supernatural action is not a part of such service, but a necessary preliminary to it. Therefore the "Introduction" which contains everything up to and including the Absolution, inviting us to penitence and confession and absolving us from sin, is now printed separately. After this follows the service itself; an act of worship on the part of the people who have been thus prepared for it. Hence the whole stress, even for the least instructed church-goer, falls where it ought to be; and the congregation is reminded of the need of a definite break with the distracting life of the senses, a cleansing of the mind and recollecting of attention, for the solemn act of devotion to God. The same principle, which has not only a directly religious but also a great psychological importance, is acknowledged in the new order for Holy Communion: where the part preceding the Collect is clearly described as "introductory," and a permissive Devotion for the priest and people, preparatory to entrance on this most solemn act of our corporate life, is also given. So on all these counts — a renewed emphasis on Eternity and on History, a weaving together of the gifts of tradition and of growth, a due and balanced regard to the part played by the mind and the senses in all full religious life, a meeting and helping of a wide variety of souls at many stages of development — we can surely say, in spite of details which we may not appreciate or understand, or omissions which we regret, that the Revised Prayer Book does mark an advance towards a more profound, wider and more living conception of worship. It strengthens the sense of tradition and the sense of strangeness; both of which must be present if any religious rite is to exhibit its full beauty and exert its full power. It emphasizes the fact that for ordinary men and women, living the life of sense, the supernatural must be given in close union with natural interests and natural things; and is by God so given. And here, perhaps, it is permissible to say that the painful discussions concerning the Epiklesis appear to take place on a level somewhat lower than a truly supernatural religion requires. For surely the Epiklesis simply affirms the principle that the Spirit of God is at all times and under all dispensations, whether in union with Our Lord's Incarnate Life or not, still the only source of supernatural life and transfiguration — and that this Spirit can and does make matter itself the direct vehicle of grace. Further, the Prayer Book as revised perpetually reminds us-and more clearly and steadily than the Book of 1662 — that we are, as Christians, already part of a vast supernatural society; that we live here and now with our transfigured brothers and sisters the Saints, in that one spiritual and eternal world of which God is the life and light. We are encouraged to present to Him with an equal confidence our desires for the living and the dead. We are taught to place together in one prayer "thy whole Church in Paradise and on earth" — and ask that we, serving here, may be "strengthened by the fellowship of the saints in light." To me one of the most precious of the things which the new Book has given — or rather restored — to us is the lovely Commendation of the Departing Soul: opening up as it does at humanity's most desperate and mysterious moment, the vast horizons of that Invisible World. In the Name of God the Father Almighty, who created thee. In the name of Jesus Christ, who suffered for thee. In communion with the blessed Saints, and aided by Angels and Archangels, and all the armies of the Heavenly Host. May thy portion this day be in peace, and thy dwelling in the heavenly Jerusalem." And if any practical mind objects at this point that the dying are seldom able to appreciate liturgic beauty, is it nothing that they should go from us accompanied by the thoughts and prayers evoked by such words "In Communion with the Blessed Saints, and aided by Angels and Archangels and all the armies of the heavenly host"? or that those who are with them should thus be lifted, even for an instant, from all narrow, bitter, self-regarding grief, to a contemplation of the great destinies of the Christian soul? A form and method for our common acts of worship, consecration and communion, which makes the Christian's life of prayer to close on such a note as this, can hardly be condemned as wanting either in spirituality, historicity, or actuality. For it strikes at once the transcendental and the homely, the corporate and the individual notes; and binds the Church Visible and Invisible into one. REV. PROFESSOR F. R. BARRY, D.S.O., M.A. Is good enough for me." But is that the sole consideration for members of a missionary Church? Evangelization is and always must be the Church's primary and compelling task. And I want to discuss the Revised Book from this standpoint, thinking not only of its use by professing members of the Church, but of its power as a missionary instrument. That aspect is too often forgotten. But it is a maxim of studying religions that the key to knowing the heart of any religion lies in the study of its prayers. More than anything else our forms of worship shape and colour men's thoughts about God: and the seeker judges the faith of Christianity, its significance and its appeal to him, by the impression Christian worship makes on him. The Church is charged to express through its worship no less than through the lives of its members the Christian conception of God's character. And the strength or weakness of the Church's worship, is the strength or weakness of its evangelism. This is my own chief interest in the matter. Others will deal in the course of these lectures with the liturgy and with the various services. But I want to speak not of any special detail, whether of language or of form and structure, but rather about the background of revision; that is to say, the general philosophy, the attitude to religion and to life, which lies behind the Book now presented to us. Let me begin by calling your attention to a humble, but quite excellent piece of work, the Preface of 1927. In the two hundred and sixty-five years which have passed since the last revision the whole face of the English world has changed. The book that then reached its final stage was intended for a tiny nation in what seems to us a tiny world. The population of the British islands was perhaps some five million — a simple, more or less homogeneous, and essentially church-going people. I imagine that even in 1662, with a population of nearly six millions, and after all the ferocious controversies, almost everyone went to church or chapel. Public worship was taken for granted. To-day, with a population ten times greater, the Book is used by certainly no more and probably by even fewer people than in the time of the Tudors and Stuarts. It concerns but a small fraction of the nation. Accurate figures cannot be obtained, but it is painfully clear to everyone that only a very small minority of the population of 1927 is concerned with institutional religion. It is said that at least 75 per cent. — and the proportion should probably be higher — are outside the frontiers of any Church. The number of Anglican communicants at Easter, 1924, was rather less than two and a half million. If we can safely estimate not more than one in ten of the English population as effectively members of the Church of England, then where are the nine? That is the real question. What of the spiritually dispossessed? The breach that has widened between Religion and life, or at any rate between "organized religion" and the organized social life of our people, is the real problem in the background. And one of its causes, at least, is not too obscure. The break-up of the mediaeval world which was just beginning in 1549 (though nobody could foresee the consequences) has produced an entirely new set of conditions. The leaders of the sixteenth-century movements — both in the Lutheran and the Reformed camps — were still controlled by the thought of the Middle Ages, even in their supposed reactions from it. They took over, as part of their mental furniture, the idea of the Respublica Christiana, that is to say of a unitary society which was at one and the same time, Church and State. It was merely, so to speak, decentralized and translated into terms of local groups, whether national or municipal. But they still accept the dominant idea. The Lutheran made the State senior partner, so that princes claimed the ius liturgicum; the Genevan Churches were out-and-out Theocracies. But both were working with the same conception — the fundamental underlying motive of the whole mediaeval social structure — of the co-extension of life with Religion. The Tudor Prayer Book breathes in that older climate. There is no suggestion in it, for example, that the Church has any mission to the State; there is no note of any social venture. Church is State in its spiritual aspect: the frontiers are strictly coterminous. When we say that religious toleration was a virtue yet to be discovered we mean that to all intents and purposes theirs was still the mediaeval world. It was "Christendom" becoming nationalized. Life was not yet departmentalized in the acute form that we know to-day. It was still a world in which a common faith was the organizing principle of all thought and all life's activities. "In the Middle Ages the hold of the Church was due to the fact that it could satisfy the best cravings of the whole man: his love of beauty, his desire for goodness, his endeavour after truth. In these days the demand for certainty is distracted by conflicting claims. In the Middle Ages it was not so; the divine mystery was felt to inspire a divine order in which all knowledge and all emotions could be reconciled" (Powicke in The Legacy of the Middle Ages). That world is still behind the old Book, though it was already in decay and was vanishing before 1662. The old system was broken up. One by one the various departments of thought, activity and interest have broken loose from the control of religion and theology and established their claim to independence. Ours is a world of specialized techniques, each conducted according to its own laws, each with its own standards of valuation, and none — as such — acknowledging allegiance to the values or the sanctions of Religion. That process was inevitable, and seen on a large scale map it was right. Apart from it none of the subsequent achievements of the human spirit would have been possible. But we have had to pay a price for it. As each of these various activities have repudiated the sanctions of religion, life has lost its moral unity. We live in a world that is all at cross-purposes because it has no one standard of reference. It is not related to that common purpose which Religion calls the Will of God. There is no agreed faith in the meaning of life. And religion itself has been left high and dry in our highly specialized twentieth-century world, as one sphere or department of life side by side with all the others. Here is the breach which we all deplore, and it is not only the world which is the loser. Religion itself is constantly in danger of becoming self-conscious and exotic because it has so few vigorous roots stretching out into life and action. It is only these that keep it sane and wholesome. That is the characteristic Anglican emphasis. And the Church is no longer, as it was of old, a fellowship of common life and work, lit by the sunshine of a common faith and fructified by corporate prayer and worship, but an association of individuals mainly for devotional purposes. Religion and life have thus come apart. And the shrinkage of the old parochial system to one that is in effect congregational — to whatever various causes this is due — only intensifies this unhappy tendency. The result is that in a world so rich and varied in interests, in daring, in constructiveness, so mighty in power, so big with opportunity as that which is the context of our lives, Christian worship is tragically ceasing to express the aspirations of our people, to unify modern life, and to redeem it. It remains the hobby of the devoted few. It is this completely altered situation which confronts us in 1927. Attempts are being made in all directions to popularize and "humanize" religion. But deeper than all suggested remedies lies one fundamental need — for a richer and deeper conception of God. Worship shapes men's thoughts about God. And we cannot allow our forms of public worship to stay for ever framed on that thought of God which the Tudor and Stuart Prayer Books express, in a world so much vaster than they knew. That condemns Religion in advance to remain within its watertight doors, cut off from the values and claims of modern life. We must rather enrich our conception of God (and therefore of what is involved in public worship) to be adequate to our own much bigger world. That is the sufficient case for revision, apart from all questions of discipline and order. And it is because it helps to meet this need that I will do everything within my power to encourage the acceptance of the new Book. It is said that men's theological conceptions are partly at least the reflex of their politics. And in any case it is obviously true that the thought of God which controls a given period is conditioned by the general forms of thought which supply the material for its concepts. It is worth while, therefore, to remind ourselves of the institutions and outlook upon life which coloured our ancestors' ideas of God. To begin with, from the political point of view, it was an age of unrepentant nationalism, uncriticized and self-sufficient. The lost idea of a commonwealth of peoples was not yet reborn in the popular mind. The old mediaeval recognition of the interdependence of the race, repudiated by Renaissance nationalism, has still to be rediscovered through the sheer pressure of economic facts. But not till trade conditions grew more complex was the lesson re-learnt in the school of suffering that no people lives or dies unto itself. And inevitably these limited horizons foreshortened men's conception of the Deity. The idea of God was as strongly nationalized as it had been in the Books of Kings. War was accepted as inevitable, and was not yet an affront to men's consciences. Piracy was a form of national service. The Englishman's God was on the side of England. and the King's enemies were the foes of God. The new clause in the prayer for the Church (" We beseech Thee also to lead all nations in the way of righteousness and peace"), the insertion of Collects for the League ,of Nations, declare how far we have travelled since then. And, again, the forms of social structure were far more simple and elementary. The old Book reflects a stage in our history before we possessed a standing army! The immense complexity of groupings, of societies within society, which gives our world its richness and its difficulty, had not yet emerged upon the stage. That vast re-moulding of European life, symbolized by the phrase "Industrial Revolution," was still two centuries ahead. A uniform pattern of social organization under a centralized despotic government is reflected in that desire for uniformity in men's approach to the throne of God which is the assumption behind the Tudor Book. But a world so much more varied in its structure, so infinitely richer in experience, cannot express its outreach after God in one standard form, however noble. The old Book had become impracticable. Worse than that, it had become misleading. It suggests too simplified a map of Heaven. The demand of our time for more elasticity is not seditious, it is God-given. God is greater than all our thoughts about Him, but at least He has shown us that the divine life is incalculably richer and more pregnant than was dreamed of in our fathers' philosophy. Their conception of life was still patriarchal — in one great reign it was matriarchal — and that conception was responsible for one idea that was definitely false. God — the Father of our Lord Jesus Christ — was imagined too much in the guise of Yahweh. For in fact their gloriously right desire to purge and simplify mediaeval worship, and press back to the Scriptural foundations, led the Reformers into one false emphasis. Their minds were too much coloured and impregnated by the Jewish Scriptures — the Old Testament. "There are divines," as Jeremy Taylor said, "whose doctrines and manner of talk and practices have too much squinted towards the Law of Moses." The Reformers' vision needed this corrective. They had a perfect passion for discovering Old Testament precedents for every thought. They would not let you baptize a Christian baby without a reference to Noah's Ark. You could not marry a maiden of nineteen without recalling Abraham and Sarah! For, remember, the old Book was compiled before the days of Biblical criticism, and its attitude to its scriptural sources is impossible for us to-day. The Bible is regarded as one book, in which Luke and Leviticus, Joshua and John stand on the same level of inspiration. And this is no mere question of the lecture room. It means that the thought of God in a book so coloured is at times quite definitely sub-Christian, not merely in the actual phraseology, but in the attributes ascribed to Him. Sickness, for example, is regarded — in flagrant contradiction to the mind of Christ — as the direct will of the Eternal, who thus punishes us for our good. It is definitely "God's visitation", that is the stock view of the Old Testament against which Job so passionately protested; but it was repudiated by our Lord. It was inevitable that an age saturated at once with the Old Testament and with Stuart or Tudor views of Sovereignty should conceive its God too much in these terms. He is for them, if not a divine Chief Justice, at least completely transcendent and monarchical, seated upon His throne, judging right, ordaining all things by His direct will dispensing or withholding what we prayed for: The notion of the divine as also immanent in the tasks and opportunities of life was not disclosed to the thought of that age (the modem substitution of the" Crown" for the old direct reference to the "King" is a symbol of an immense change of outlook). And by consequence the scope of its worship had in the nature of things become too narrow for an age whose whole attitude to life rests on an evolutionary philosophy. In other words, the whole cast of mind which lay behind the Prayer Book was Hebraic, with a too exclusive emphasis on Virtue, and a relative neglect of Truth and Beauty. Its preoccupation was mainly with Redemption in the sense of deliverance from sin. The background which is really presupposed in that, the thought, i.e., of God as Creator, of the Spirit operative in the world, is not suggested with sufficient strength to satisfy the needs of our generation. For our world is humanist and Hellenic; fullness of life is its dominant desire and dullness its unpardonable sin. However badly we fail of our objective, at least our world is a bigger world than theirs. And hence the content of the unrevised Book is inadequate to our spiritual needs. It is not merely that we need extra prayers; they can always be added by permission. It is rather that the content of the Divine Will as conceived in the old Book is inadequate. Two-thirds of life seem to lie outside it. The controlling interests of our modem world have little place in that older thought of God. This lay behind that devastating feeling of unreality and remoteness in the worship offered in our Churches which sapped the loyalty of so many men. "A veil was laid upon their hearts as often as the Prayer Book was read among them." For the Christian religion seemed to be offered to men not as a consecration of their interests, but as an alternative to the diverse claims , opportunities, and pleasures of the modern world. That was the real sting of the difficulty; it hampered evangelistic and pastoral work. It is vain to hope that in the twentieth century any merely historical presentation of Christianity can be satisfying. The whole stress of modern life is activist, the tendency of our thinking teleological. The concrete realization of value, the quest for truth, the expression of beauty, the achievement of social and industrial righteousness, are for us the meaning of the will of God. The Christian ethic can never be for us mere reference back, mere reminiscence, but the flame of Spirit leaping from heart to heart in and through the actual tasks of life. And this we must needs express in our worship, if "life" and "religion" are to come together. And that is why I am grateful for the new Book. With the permissive changes and omissions, nothing is compulsorily said or implied about God which I cannot say sincerely. Those for whom the Stuart Book is satisfying have still full liberty to use it. But for those who agree with the main lines of this lecture the new Book brings a huge relief to conscience! Not, of course, that the . draftsmen of the new Book have invented a new conception of the Divine or tried to make God safe for Democracy. It is not addressed to "God the invisible Wells"; we can trust the Bishops not to be so silly! All true discoveries about His nature are gradual, genetic, evolutionary. But it is a fair claim that all that has come to the world through that wider experience of life, which is one of the channels of God's self-disclosure, and through our new approach to the New Testament — which comes to it chiefly in order to recapture the vision of God through the mind of Christ — it is fair to claim that these spiritual conquests find their due reflexion in the new Book. It is "richer" because a wider world comes into it, and enriches the thought of the God whom we worship. And even where — as usually happens — the old forms and language are retained, I can yet perceive a new light breaking through, the light which St. Paul describes as "The Glory of God shining in the face of Jesus Christ." The thought of God which lies behind the Book is more true to the character of Jesus. There is a parallel here with the New Testament. The Apostles would have been horrified to learn that they were inventing a new theology. And it would be quite untrue to say they were. They worshipped, as Paul said, " Our ancestral God" (Acts xxiv. 14). And yet, under the educative pressure of their Christian experience their thought of God was insensibly transfigured; they learnt to see God through the Master's eyes; and they prayed no more to the Ruler of Israel but to "God, and the Father of our Lord Jesus Christ." So it is here. There is no "new theology "; but there is an immense advance both in richness and simplicity. There sounds throughout a note more evangelical, and for that very reason more genuinely catholic. It makes for more reality in worship, more spontaneity in Christian living. It gathers more of God's creative work inside the Gospel of Redemption. And this is to-day the task of Christian leadership.